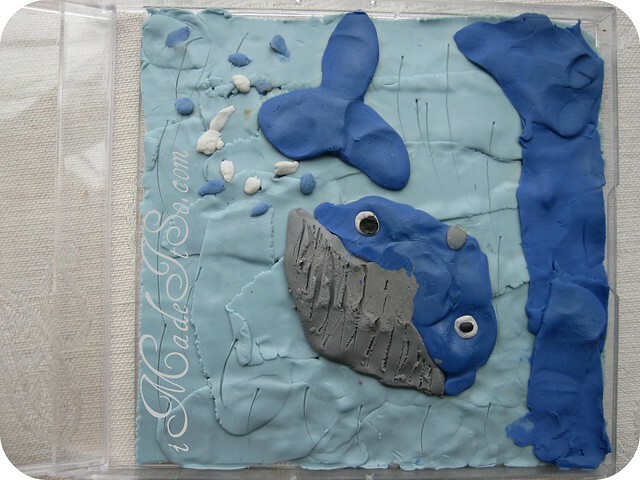 kids made it so: plasticine in a cd case | i made it so. it’s a whale, coming up for air. i thought it was a neat idea to create a scene within the frame of a jewel case of a cd and i wanted to try my hands at it. why do kids get to have all the fun? i used modelling clay. rainbow packs can be found at dollar and craft stores. better quality clay or plasticine can be found in some craft shops, educational supply stores and specialty art stores. 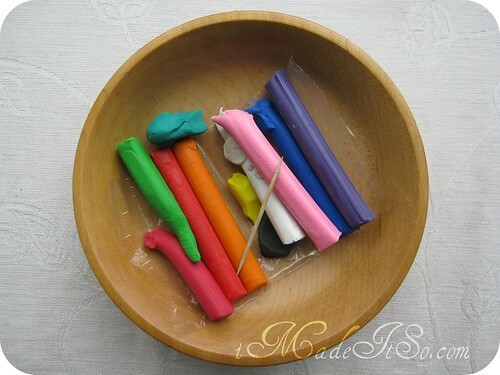 i have made my own play dough before but i don’t have a recipe for plasticine or a clay that wont dry out. if you know of a recipe, feel free to share. i used a toothpick to help manipulate the littlest bits of clay. the clay, especially after you work it with your hands for a while, tends to stick to fingers. the toothpick helped me lift and place the clay as needed for the scene i wanted to make. next time, i will write about an artist who falls into the latter category. i’m pretty sure i share no genetic matter with her, so no biases there. she is just plain good and talented. This entry was posted in ideas & inspiration, kids made it so, tools, tips and techniques and tagged art inside a cd case, cd jewel case uses, craft with kids and clay, modelling clay ideas, modelling clay in jewel case, modelling clay kids ideas, plasticine in jewel case. Bookmark the permalink. I harbor dreams of pottery wheels and ‘throwing’ clay and firing it…or at least creating tiny perfect clay miniatures. LOVE the breeching whale! and looks like you did just fine with your big ol’ fingers – LOL – ’cause that ant is just adorable. I can’t remember the last time I worked with clay. Musta been making beads. We did this craft somewhere before. I think it may have been Sunday school. I love the whale! Have you seen Barbara Reid’s “Have you seen birds?”. This is one of my favourite books. I sent it with some clay to my mom for Mother’s Day many years ago. All of the illustrations are done like yours. I think the artist does other books too. Look for her at the library! You’ll be inspired. I can’t wait to see your next clay art! Those are soooo cute! Hey- I nominated you btw. :) Good luck! adorable! and your little artist is clearly on the way to be a superstar. love the little whale. Those are both adorable! I love them both, so cute! That whale is amazing! It’s so adorable and I love the perspective too. A very very cute idea by the way and I think it’s great you also went and made such a lovely one yourself. 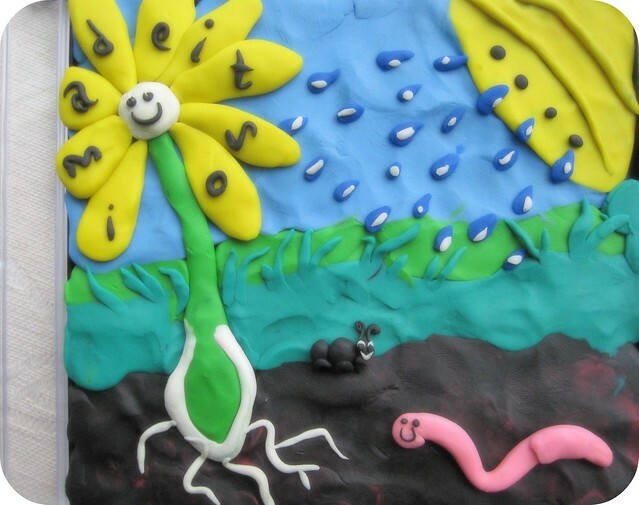 Pingback: barbara reid: author and illustrator (and talented plasticine artist) | i made it so. That’s an amazing idea – it would add a really cool personal touch to almost anything in a jewel case! I just love the garden scene good job. I wrote a book on this subject. You can find it if you search “Making and Improving Modeling Clay”. I was inspired to spend a year studying the composition of modeling clay, and worked out some of my own recipes with instructions on making it harder or softer depending on the season (temperature outside). hi don. i think i found the book. very interesting. my daughter enjoys making stop-motion animations and it would be great to make soft clay ourselves. how long does your recipe stay soft typically? My recipe stays soft forever. It is a wax-based clay, so it doesn’t dry out. There are several recipes in the book that cover everything from the least toxic to the most potentially toxic clays. But I have been making my own clay for almost a year and have not had any problems. The “toxic” recipes have talc in them, which is probably the biggest concern. The non-toxic ones have other fillers that won’t irritate the lungs. As this is dealing with wax, your daughter will need adult supervision. It gets very hot and will hurt if you splash it on your skin. But what I really like about it, is that the clay does not have to be covered and it can not be baked. Once soft, always soft. My favorite kind of clay.